We the jury find that the original 1957 classic directed by Sidney Lumet will be acquitted on Blu-ray in November. 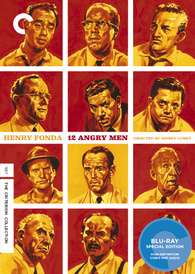 In an early announcement to retailers, the Criterion Collection will proudly present '12 Angry Men' on Blu-ray on November 22. A behind-closed-doors look at the American legal system as riveting as it is spare, the iconic adaptation of Reginald Rose’s teleplay stars Henry Fonda as the initially dissenting member of a jury of white men ready to pass judgment on a Puerto Rican teenager charged with murdering his father. The Blu-ray will feature a new 1080p digital transfer, an uncompressed monaural soundtrack, and supplements include: Frank Schaffner’s 1955 television version, with an introduction by Ron Simon, director of the Paley Center for Media Studies; “Twelve Angry Men”: From Television to the Big Screen, a video essay by film scholar Vance; Kepley comparing the Sidney Lumet and Schaffner versions; Archival interviews with Lumet; New interview about the director with writer Walter Bernstein; New interview with Simon about television writer Reginald Rose; New interview with cinematographer John Bailey in which he discusses cinematographer Boris Kaufman; Tragedy in a Temporary Town (1956), a teleplay directed by Lumet and written by Rose; Original theatrical trailer; and a booklet featuring an essay by writer and law professor Thane Rosenbaum. You can find the latest specs for '12 Angry Men' linked from our Blu-ray Release Schedule, where it's indexed under November 22.